This tax season, some Americans will receive a financial boost from federal and state refunds while others will face unexpected payments. It presents an opportune moment to consider the ways in which our tax policies could be changed to better support work and families. In response, we highlight three types of reform that would promote work, focusing on secondary earners, caregivers of young children, and low-wage workers. Working women earn less than men on average. In late 2018, median weekly earnings for women were 80 percent of median weekly earnings for men, measured before taxes and for full-time workers. 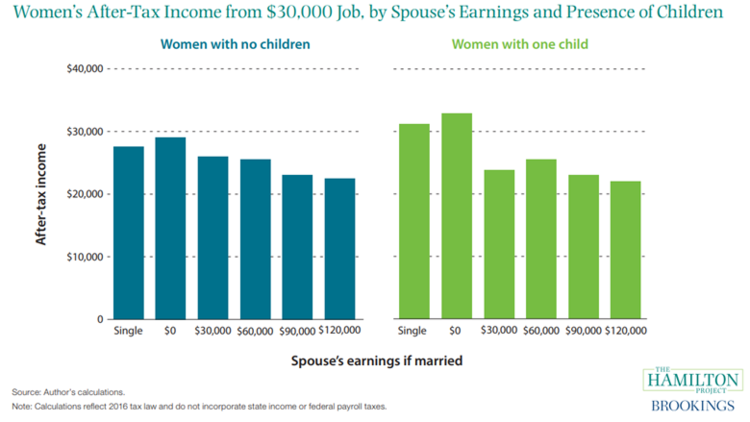 Surprisingly, the gap between women and men’s earnings is even larger when measured after taxes. The tax treatment of married couples raises the tax rate faced by the spouse who is the lower earner (also known as the secondary earner). Because secondary earners are predominately women, this increased average tax rate tends to lower married women’s labor force participation. Research by economist Sara LaLumia and others shows that joint taxation—the practice of taxing total household income—suppresses participation of married women relative to a system of individual taxation. Particularly for families with large gaps in earners’ wages (see the figure below)—and for those who face Earned Income Tax Credit (EITC) phaseout and loss of other benefits—the after-tax return to work is low. By making work less valuable, existing tax policy leads many women to leave the labor force entirely. LaLumia describes a set of options for changing the tax treatment of married couples to address this problem. One such option is a secondary earner tax credit, proposed by economists Melissa S. Kearney and Lesley J. Turner. It is a practical step that would raise the returns to work for many secondary earners. Kearney and Turner propose a tax deduction equal to 20 percent of secondary earnings, up to an earnings cap of $60,000. Eligibility for this deduction would begin to phase out at $110,000 of family income, focusing its benefits on low- and middle-income families. The lack of affordable child care keeps many people on the sidelines of the labor market when they would prefer to work. One estimate puts the average cost of infant care at a center-based program at nearly $16,200 per year. Evidence suggests that more women will work when child-care is affordable. Economist Elizabeth U. Cascio therefore proposes eliminating the child-care tax credit and the Dependent Care Flexible Spending Account, replacing them with a single refundable federal child-care tax credit. 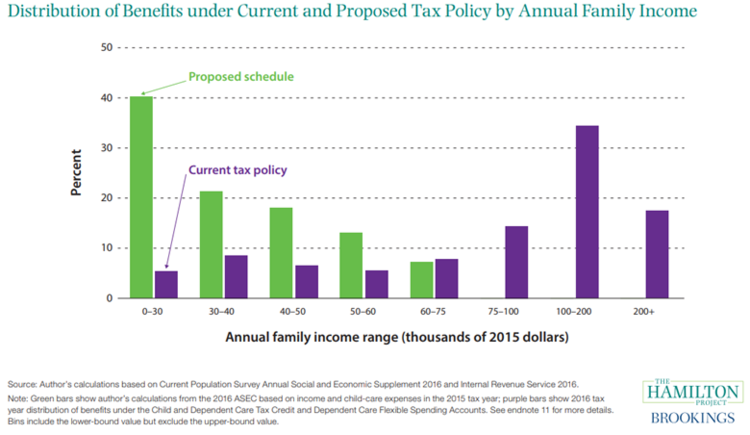 This tax credit is more generous to those for whom child-care costs are especially prohibitive: both lower-income families and families with children under the age of five (see the figure below for the distribution of benefits under the current and proposed policies). Cascio’s approach would lessen the financial burden of child care, encourage labor force participation, and support child development. The last several decades have been dismal for low- and middle-income American workers. The reasons for this wage stagnation are not primarily about taxes, but improved tax policy can be part of the solution. One of the most important policies for supporting working families is the Earned Income Tax Credit. In addition to supporting low-income families, the EITC raises labor force participation. 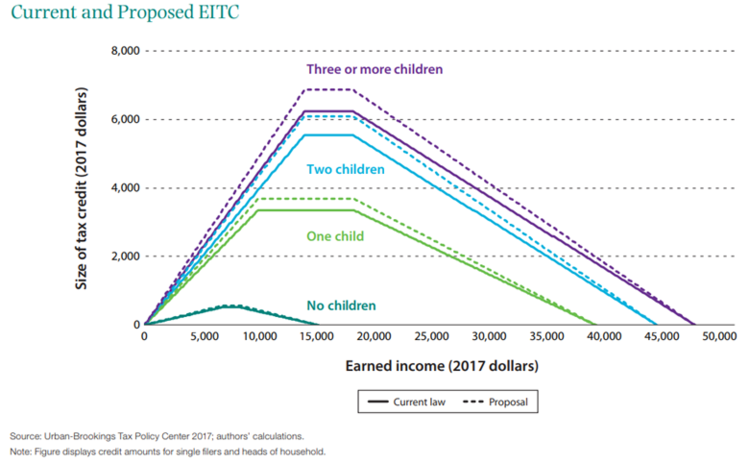 Economists Hilary Hoynes, Jesse Rothstein, and Krista Ruffini describe the evidence of EITC impacts, proposing an across-the-board expansion in the program to more fully exploit its benefits. This expansion is particularly called for given that the maximum EITC has been frozen in inflation-adjusted terms for most families since 1996. Enlarging this anti-poverty program would help to increase after-tax income for many low- and middle-income families. About 20 percent of all tax filers, and more than 40 percent of families with children, currently receive the EITC and would see enhanced after-tax wages under the proposal. A 10 percent EITC increase would provide a single parent of two, working full time, year-round at the minimum wage, with an additional $560 under the proposal (see the current and proposed EITC schedules below). EITC benefits can also improve health and education outcomes for millions of children. A growing body of evidence shows that EITC benefits are linked to better maternal health as well as higher test scores for participants’ children, with greater education attainment translating to higher earnings in adulthood. Fixing the U.S. tax code—and making labor markets work for all Americans—will take more than these three ideas. But policymakers should start by implementing reforms for which we have strong evidence and a clear path forward. Ryan Nunn is the policy director for The Hamilton Project and a fellow in Economic Studies at the Brookings Institution. He is a member of the panel of experts for Occupational Licensing: Assessing State Policy and Practice, an initiative of the National Conference of State Legislatures, National Governors Assocation, and The Council of State Governments.